BACKGROUND: Purple loosestrife is a semi-aquatic plant native to Europe, probably introduced as an ornamental. Valuable riparian habitat is degraded, and food species are rapidly displaced by this weed, which has no wildlife value. 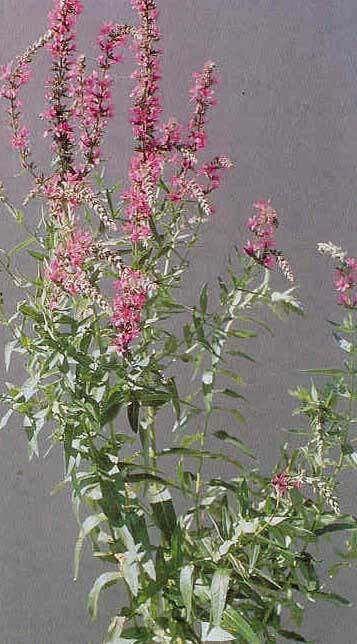 Purple loosestrife spreads both by seed and spreading rhizomes that form dense, woody mats. DESCRIPTION: Purple loosestrife is a semi-aquatic, hardy perennial that can grow over 8 feet tall. Stems are usually 4 sided and much branched, bearing opposite or whorled, 4-inch long, lance-shaped leaves. Crowded flower spikes develop at the stem tips in midsummer. Flowers are 1-inch in diameter with 5 to 7 reddish purple, wrinkled petals that appear as if they have been crushed. A single plant may produce over 2.5 million tiny seeds per year. DISTRIBUTION: Purple loosestrife is found throughout the northeastern U.S. and in some western states and in Idaho. CONTROL: Biological control agents are available and include 2 leaf beetles that have worked well in Idaho. Herbicides are available, but effectiveness on purple loosestrife is inconsistent and application is difficult.